What they said about Michigan winter! 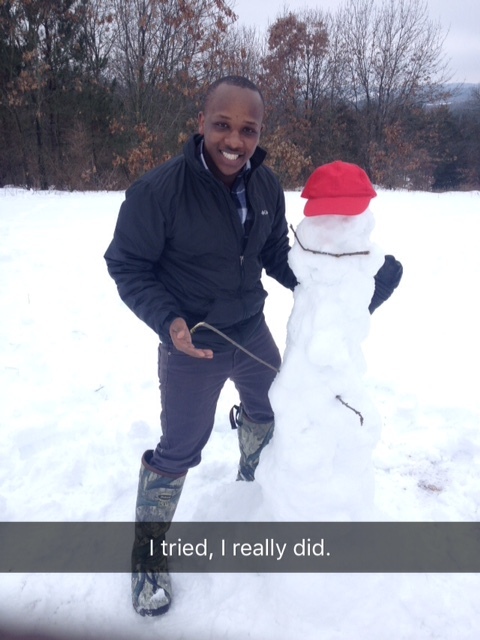 Trying to make a snowman. I have tried to enjoy every minute of winter if anything, I really like winter having experienced the Michigan one; not as much as summer experienced in California. As an international student, the third question everyone asked after my name and if it was my first time in Michigan was if I had ever seen snow. After I said no, the kind of advice that would follow would be that I needed to get jackets, gloves, snow shoes, some heavy duty socks and basically my wardrobe needed to change. I appreciated the many suggestions and did as told thanks to the many thrift shops in Michigan (I should be the thrift stores brand ambassador). Then there were others who made Michigan winter sound like a place not to be at during winter. The scary stories about people getting sick, cars getting into ditches; never ever getting to see the sun, and maybe having to wake up in the morning during winter. Then there was a special kind of people, the wohooo!! The sanguine personalities who would say “Hey Mordecai, woohooo you will love winter”. They would suggest activities like Ice skating, Go sledding, do some skiing, make snow angels, make a snow man. These kinds of people made my winter bearable and fun. These are the kinds of people who during fall, they suggested we go apple picking and during summer, they suggested we go swimming: These is never a dull moment with these kinds of people in every season when good and bad. I think life has different kind of seasons as well. There are seasons when everything is bright in our life’s, everyone is cheering at us , everything looks good and we feel so blessed but also there are moments we all go through tough times and sometimes we hate those (winter) moments- when life is too cold. Also there is the part where you listen to people talk about your season in a positive way and a negative way and it is up to you to surround yourself with the people who have the right attitude for every season. The beauty about seasons is that God created them all and there is nothing we can do to change that. If anything, our response in these seasons is what matters most. We can choose to hate a certain season and it will be such a dull moment but we can also choose to endure and find something interesting about the season and what you can do in that season. In tough times, worry will not help, panic will not either. Imagine though is we embraced the cold, get some warm clothes, learn how drive in snow, go sledding, Ice skating? Imagine making memories snow fighting, waking on iced lakes, doing some doughnuts drives? Imagine making the cold season much more fun? So be encouraged and take heart.